1 The estimated $11 billion spent through CCDF and related government funding streams in fiscal year 2009 includes estimated expenditures on direct child care services of $7.2 billion in federal CCDF funds (including the Child Care and Development Block Grant and supplemental funds appropriated through the American Recovery and Reinvestment Act , the Child Care Entitlement to States, state matching and maintenance of effort (MOE) funds for CCDF, and transfers from the Temporary Assistance for Needy Families Block Grant (TANF) to CCDF). Additional expenditures include $1.8 billion in TANF funding spent directly on child care services, $1.6 billion in “excess TANF MOE” (state child care expenditures claimed as TANF MOE to the extent such amounts are above the amounts already claimed as CCDF MOE), and $0.4 billion in Social Services Block Grant expenditures related to child care. 2 The 2009 estimates of eligibility were produced using the Transfer Income Model (TRIM), a micro-simulation model maintained by the Urban Institute under contract with ASPE. TRIM converts annual data from the Current Population Survey (CPS) into monthly data, compares these monthly data on family income and work status to CCDF rules, and generates monthly estimates of children and families eligible for CCDF child care subsidies. Monthly estimates are averaged to produce an average monthly estimate for the year. The 2009 estimate of eligibility relies upon data from the CPS for calendar year 2009, federally-permitted eligibility rules under CCDF, and state-defined eligibility rules reported in ACF’s CCDF Policies Database as of October 1, 2009. 3 States are given broad flexibility in deciding what is countable family income for purposes of determining a child’s eligibility. For example, states could disregard TANF payments in income eligibility determinations. As a result, some states may serve children in families with unadjusted incomes greater than 85 percent of the state median income, as defined in this Issue Brief. In FY 2009, the mean value of the federal maximums (i.e., 85% SMI) for three person families was about $4,130 per month (about $50,000 annually). However, the average initial eligibility limit before applying disregards for the states was about $2,830 monthly ($34,000 annually) as of October 2009. State SMI is based on estimates published for fiscal year 2009 in the Federal Register: March 5, 2008 (Volume 73, Number 44). 4 For this eligibility estimate “working” includes all work of one hour or more in a month. The majority (83 percent) of federally-eligible children come from families where the parent or parents were employed an average of at least 20 hours per week. An estimated 8 percent of federally-eligible children did not live with a parent who was employed an average of at least 20 hours per week. An estimated 9 percent of federally-eligible children lived with a parent that was not working but was in school. 5 This estimate of receipt excludes about 10,400 children served in U.S. territories as well as children receiving services from only Head Start, state pre-kindergarten programs, or other early childhood programs without funding from CCDF or related government funding streams. 6 CCDF-funded children include children funded through federal CCDF funds, state CCDF funds, and transfers of TANF funds to the CCDF program. While some states include children other than CCDF-funded children in their child care data reports (generally because they combine funds from several funding streams into one child care program), these states also report the percentage of pooled funding coming from CCDF, and this percentage is used to estimate the CCDF-funded children. The estimate assumes that children funded by TANF, TANF MOE, and SSBG have the same subsidy costs per child as CCDF-funded children, about $355 per month based on state-reported ACF-801 administrative data, and the same age and poverty distribution as CCDF-funded children. 7 Poverty figures are based on 2009 poverty thresholds published by the U.S. Census Bureau, Housing and Household Economic Statistics Division. The Census Bureau threshold is divided by twelve to create a monthly, rather than yearly, threshold. For purposes of determining recipients’ poverty status for this estimate, recipient income is measured after any applicable state-determined income disregards are applied. This estimation process likely overestimates to a small degree the number and percent of children from families below 100 percent of poverty who are served. 8 Based on data from ACF’s CCDF Policies Database as of October 1, 2009, recipient eligibility was redetermined every twelve months in 22 states and every six months in 29 states. 9 The range of income eligibility limits is based on data as of October 1, 2009. In some states eligibility limits differ for certain groups, such as TANF and SSI recipients. Expressed in terms of state median income, state limits for initial income eligibility in CCDF plans for fiscal year 2009 ranged from 38 percent to 86 percent of SMI. This estimate of state median income for fiscal year 2009 is based on the U.S. Census Bureau calculations published in the Federal Register: March 5, 2008 (Volume 73, Number 44). 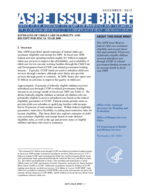 While the law restricts eligibility to children from families below 85 percent of SMI, states are able to determine the method used to calculate state median income which may differ from the method used in this Issue Brief. 10 Some of ASPE’s previous eligibility estimates excluded children age 4 and older that lived with at least one parent working between 1 and 19 hours per week. The estimates shown in this Issue Brief include this population when it is otherwise eligible. Had the previous methodology been used, the estimated number of children eligible under state-defined rules would have been about 3 percent lower (8,593,800 instead of 8,862,200) and the percentage of children served who were eligible under CCDF state rules would have been about 1 percentage point higher (29 percent instead of 28 percent). This change in methodology was made to provide greater internal consistency with the numerator of the calculation, which includes all children receiving subsidies, including school-aged children living with parents working less than 20 hours per week. This change does not impact the estimated number of children potentially eligible under federal parameters. 11 These numbers overstate to a small degree the percentages of children that are eligible under federal parameters that are also eligible under state-defined rules because some states define the eligibility units differently than what is used to define the eligibility units under federal parameters in this Issue Brief. This issue is discussed further in Appendix I. 12 For additional information on previous changes in the estimation of eligibility and receipt through 2006 see Child Care Eligibility and Enrollment Estimates for Fiscal Year 2005 (http://aspe.hhs.gov/hsp/08/cc-eligibility/ib.pdf), and Estimates of Child Care Eligibility and Receipt for Fiscal Year 2006. http://aspe.hhs.gov/hsp/10/cc-eligibility/ib.shtml. 13 Other methodological changes not described in the above text include: changes to the estimation of monthly earnings based on the number of days in each month and the reported hours worked per week; imputations to underreporting of child support payments for children also receiving TANF cash benefits; and the treatment of children receiving Supplemental Security Income. 14 The 516,000 estimate was calculated using the TRIM methodologies in place when the 2006 estimates were released. The modeling improvements implemented after 2006 were not used to calculate this number. 15 Where possible, improvements in the methodology and model for child care estimation have been applied to estimates of child care eligibility and receipt in previous years. For this reason, prior year estimates shown in Appendix Figure 1 will not match estimates published in previous Issue Briefs.